Above: Course of infection of a bacterium (brown rectangle) with bacteriophage (red hexigon with green tail). 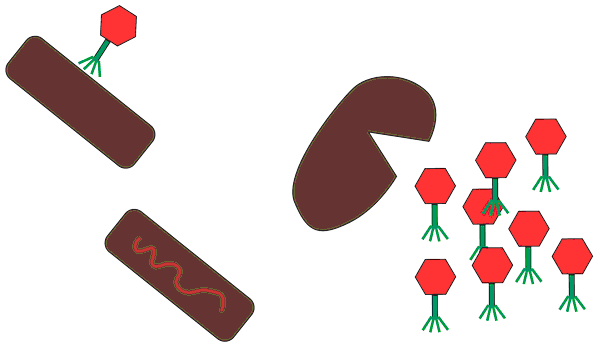 Above: Defending bacterium (brown rectangle) binds to attacking bacterium (yellow rectangle) by green tail-like structures (green branches). The outer cell wall of the attacker ruptures and it dies (at right). Above: Worm larva binds to the tail-like structures on the bacterial surface, which induces the worm to attach and metamorphosis into an adult. Chapter 13 of LOTD is "Attaching to the Dock". In this essay I expand and update this subject with a brief summary of a recent paper from Shikuma et al. which reveals molecular details of the attachment of a tube worm (similar to the one described in the January 2014 essay) to the dock. It has twists and turns and uncovers a conundrum. Bacteria are present in fairly high concentrations in the oceans, a fact that was not realized until a few decades ago because these marine bacteria did not grow on culture media. Mixed with the bacteria in the ocean are bacterial viruses (bacteriophage). As shown in the top panel on the right the viruses bind to the bacterial wall and inject their DNA (the red wiggle in the middle cell). The viral DNA replicates, produces viral proteins which then encapsulate the DNA to produce many new virus particles. The infected bacterium then bursts to release new virus into the ocean. Marine bacteria are not only attacked by viruses, but often by other species of bacteria. The molecular weapons have evolved during millions of years of warfare, and one is made of proteins (bacteriocins) very similar to the proteins used by viruses to attach to and attack bacteria. In the middle panel on the right an attacker (brown rectangle) encounters its victim (yellow rectangle) and inserts its bacteriocins (green fingers) into its wall. The bacteriocin tears open the wall of the victim and kills it (far right image in pane). In Chapter 13 of LOTD I describe colonization of The Dock as a sequential process. An early stage is the growth of bacteria on the surface to make a biofilm. The new results presented in Shikuma et al. is that the tube worm Hydroides elegans binds to a biofilm of the bacterium Pseudoalteromonas luteoviolsacea using the bacteriocins on its wall. Not only does the viral-like protein cause the worm larva to bind, it also triggers the metamorphosis of the larva become an adult. Bacterial, viral, or worm genes? Did bacteria capture viral genes that code for tail attachment proteins and use them to make bacteriocins, or did the virus capture bacteriocin genes and use them to make proteins that allow it to attach to the bacterium? The answer to this conundrum may be that both are true. Virus and bacterium have lived and died together for millions of years. They share genetic information, and use it for their own purposes. A question not addressed in Shikuma et al. is the nature of the structures on the skin of the worm that bind to the bacteriocins. Where did the genes for those proteins come from?